[2014-03-10] Dr. Massimo Tisi will give a talk about his research topic ``Model-Driven Engineering in Large-Scale Systems'' on March 11 at NII. Everybody is welcome. Click here for more details. [2013-09-05] The BiG Camp (photo) was held at The International Seminar House for Advanced Studies, September 2-4. [2013-08-08] Our paper on A Parameterized Graph Transformation Calculus for Finite Graphs with Monadic Branches will be presented at PPDP 2013. [2013-06-10] Our paper on Structural Recursion for Querying Ordered Graphs will be presented at ICFP 2013. [2013-01-22] Our internship student will present A Bidirectional Collaboration Framework for Bio-Model Development in which our system is applied, at BX 2013. [2013-01-21] Zhenjiang gave a keynote talk at ACM PEPM 2013 on practical aspects of bidirectional graph transformation (slides). [2012-12-11] Our paper on bidirectional graph transformation system GRoundTram has been accepted by a special issue of Progress in Informatics. [2012-09-17] 1st AtlanMod-BiG Joint workshop on Bidirectionality in Model Transformations was successfully held in MINES ParisTech and Hotel Mercure Paris Place d'Italie, September 15-16, 2012. [2012-08-27] GRoundTram System Version 0.9.3 released! [2012-06-08] The technical report "iGRT: A Generic Interface for GRoundTram" is available at GRACE-TR-2012-06. [2012-05-30] The 5th ICMT (Zhenjiang served as PC-Cochair, 2012) was successfully held in Prague. [2012-01-27] Our paper on Maintaining Invariant Traceability with GRoundTram will appear at ICSE 2012. [2012-01-13] Our work on "Bidirectional transformations on Ordered Graphs" is summarized in the technical report GRACE-TR-2011-07. [2011-11-25] Our paper on view updatability checking has been accepted by Journal of Computer Software (JSSST). [2011-07-19] Our paper on the bidirectional graph transformation system GRoundTram will be presented in ASE 2011. [2011-07-19] 52nd ToPS seminar will be held at NII, August 3, 2011. [2011-06-14] 51th ToPS seminar will be held at NII, June 21, 2011. [2011-05-26] Our work on graph transformation optimization will be presented in LOPSTR 2011. [2011-04-20] Our work on automatic graph-transformation verification will be presented in PPDP 2011. [2011-04-20] 5th BT-in-ABC Workshop will be held in Xi'an, May 17-19, 2011. [2011-04-06] Java-based Graphical User Interface for the GRoundTram System is released. [2011-03-29] Our paper about using GRoundTram to bidirectionalization of ATL will be presented at ICMT 2011. [2011-03-25] GRoundTram System Version 0.9.2 released! [2010-10-31] The BiG Camp (photo) was held at Kazusa Arc, October 27-28. [2010-06-09] Our work on Bidirectionalizing Graph Transformations will be presented in ICFP 2010. [2010-05-11] Our work on "Sound and Complete Validation of Graph Transformations" is summarized in the technical report GRACE-TR-2010-04. [2010-04-30] GRoundTram System Version 0.9.0 released! [2010-03-02] An interview about the BiG project is on NII Today. [2010-02-27] A feature model refinement tool with updatable view has been developed using GRoundTram. [2010-02-20] We, together with University of Tokyo and Peking University, are organizing the 4th Workshop on Bidirectional Transformation in ABC. [2010-02-20] Zhenjiang is a co-organizer of the next Dagstuhl seminar on bidirectional transformations (bx). [2009-11-12] GRoundTram System Version 0.1.1 released! [2009-10-01] GRoundTram System Version 0.1.0 released! [2009-09-09] This is an interview article (in Japanese) about the BiG project. [2009-08-31] Our work on "Bidirectionalizing Structural Recursion on Graphs" is summarized in the technical report GRACE-TR-2009-03. [2009-08-02] Demonstration pages has been significantly enhanced; lots of examples added, including insertion handling. Visit here for more details. [2009-06-03] Dr. Sebastian Link will give a talk about his research topic ``Reasoning about XML constraints'' on June 22 at NII. Everybody is welcome. Click here for more details. [2009-04-01] Two members, Isao Sasano and Kazuhiro Inaba, joined to our project. 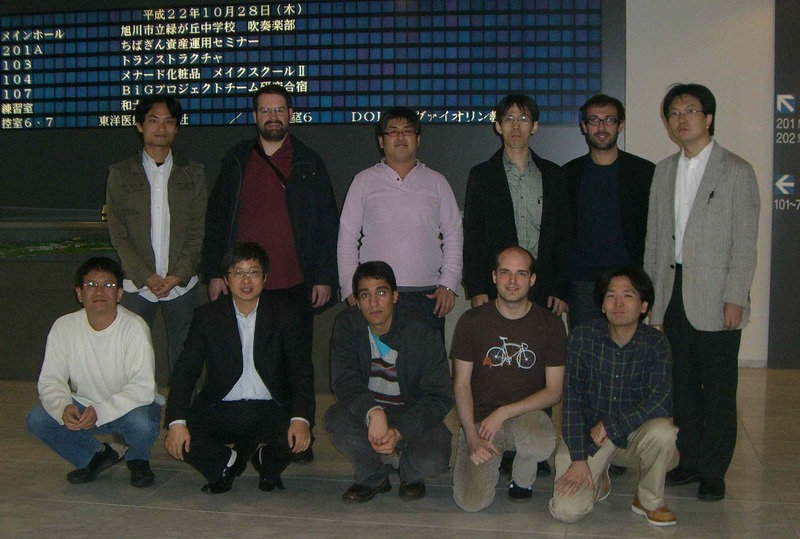 [2009-01-08] 2nd International Workshop on Bidirectional Transformations in Architechture-based Component Composition was successfully held in Shonan Village Center, January 5-7, 2009. [2008-12-08] Our presentation (about compostional approach to model transformations) in JSSST 2009 received Takahashi Award (best paper presentation award). [2008-11-28] Our paper ``Rewriting XQuery to Avoid Redundant Expressions based on Static Emulation of XML Store'' is accepted by PLAN-X 2009. [2008-10-15] Our paper ``Towards Compositional Approach to Model Transformation for Software Development'' is accepted for the Software Engineering Track of SAC 2009. [2008-09-12] A demonstration system is available. [2008-09-09] Our work on an algebrac approach to bidirectional model transformation is summarized in the technical report GRACE-TR-2008-02. [2008-08-20] Our work on a functional approach to composition of model transformation is summarized in the technical report GRACE-TR-2008-01. [2008-05-01] The project page is open.